NYC is Blue: SI: "Preparing to Step Into the MLS Spotlight"
Friday was Jason Kreis’s day in Gotham, the chance for the first coach of New York City FC to be presented to the media and discuss his vision for what NYCFC can be when it makes its debut as an MLS expansion team in 2015. With an investment of more than $500 million, including a $100 million expansion fee and what will eventually be a soccer stadium costing up to $400 million, the new club being started by the owners of Manchester City and the New York Yankees is one more sign of MLS’s progress in recent years. On a day when Toronto FC completed a stunning week of transfers to acquire Michael Bradley and Jermain Defoe, and on the day we learned MLS’s next TV contract (a deal shared by ESPN and Fox Sports) would be worth around $70 million a year, according to Sports Business Journal, it was another proud moment for MLS to see a home-grown player and coach like Kreis fit in perfectly on a podium with NYC FC sporting director Claudio Reyna, Manchester City CEO Ferran Soriano and City director of football Txiki Begiristain. The U.S. Hall of Famer and All-Time Best XI midfielder told me that he and other club officials have already met with "more than 10" potential big-name signings, either with their agents or the players themselves. NYCFC will use the maximum allotment of three DPs, whose salaries are not limited by the league’s salary budget cap. "We have to be very aggressive and active in an offensive mode with player recruitment and the player search," Reyna said. "Our approach, with Jason and I, is to go find the players we want to fit into how he wants to build the team. And not just the right people that are important on the field, but probably more important off the field. Toronto did a great job bringing Michael [Bradley] back. He’s the right guy, a top professional. Those are the kind of people we’re looking for." Reyna said he’s enjoying the DP search process. "It's a lot of fun, to be honest," he explained. "I get to travel and watch games and meet with players and their reps. Every week there’s a new name being thrown at us." This is excellent news. 2015 will be here before we know it, and the process of signing players will take much of that time. In the press conference, head coach Jason Kreis confirmed that NYCFC expects to sign three Designated Players; under my reading of the rule that third DP would cost them $250,000 in luxury taxes unless one is 23 years old or younger. Perhaps they're including young players in their search, or perhaps they're just counting on paying the relatively-minor one-time fee. As for the permanent stadium the team plans to build, Soriano said NYCFC is looking at several sites in the Bronx and elsewhere in the city. The news lately on the stadium front hasn’t been great. Michael Bloomberg was a supporter of providing city support for a stadium, but that doesn't appear to be the case so far with new NYC mayor Bill de Blasio. "We are going to be patient," Soriano said. "We need the community to say, 'We want you here,' because we're going to be here for years and years. So if it takes more time, we'll take more time. We'll talk, we'll listen. We're looking forward to talking to new elected officials. We're optimistic, first because we’re going to play elsewhere [temporarily], so we're not going to rush. And secondly because we’re not going to do anything that is not perfect." I've written before that de Blasio is almost certainly going to require NYCFC to start from scratch in its dealings with the city, a minor if expected setback. I still believe that the proposed Bronx location will go ahead, if that's what the club really wants, but likely with a diminished city contribution. Westchester seems an obvious choice for training facilities, especially if the stadium is in the Bronx. 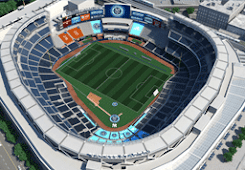 It would also play into the triangular division we're working towards, with Long Island being Cosmos Country, the Western suburbs across the Hudson belonging to the Red Bulls and NYCFC's territory encompassing the city and extending north to Connecticut. It's also very good to hear that the team's crest is almost ready to go; that's going to be a key element in reaching out to the city. The "launch crest" has been fine as a placeholder, but as the club's profile increases they have an opportunity to really establish a brand in the city's mind. Soriano is an intriguing guy, a former FC Barcelona executive who said he first tried to be part of an MLS startup in New York with Barça in 2005. He tried again with Barça in Miami later in the decade and, after moving to Man City, has now done the deal with NYCFC, which is his baby. Soriano has spent a lot of time in the city mingling with soccer fans and going to soccer bars. "There are savvy fans here, more than people think," he said. "I've seen it. You go to a bar, you watch a Premier League or Champions League game, and these American fans understand soccer. They understand the difference between excellent soccer, good soccer and bad soccer. They’re just waiting for somebody to offer good soccer [here]. This is what we want to do." This is perhaps the most exciting news of all to me, since it perfectly sums up my own situation. I've been a follower of the Beautiful Game for decades, but have had no interest in MLS. If the MetroStars in the early 1990s had expressed the slightest interest in building a soccer culture in the city, I would have eagerly jumped on board. Instead, they made it quite clear that their hearts were firmly on the west side of the Hudson, and many of us wrote them off as a result. A soccer culture did grow in the city, but it was one steeped in foreign teams, largely from Europe. Walk down any street, and you'll see bars advertising matches from the Premier League, La Liga, Champions League and the Bundesliga. Go to any youth soccer pitch in the city, and you'll see kids wearing shirts from clubs the world over: Arsenal, Man United, Chelsea, Real Madrid, Barcelona and many others. You'll probably see a smattering of MLS jerseys (although in my experience you're far more likely to see the Cosmos than Red Bulls), but those are vastly outnumbered. My son just started winter indoor soccer, and when they were issued red jerseys "Red Bulls" was jokingly suggested as the team name. Turns out that of the eight kids on the team, only one recognized it as a reference to the pro team. Two decades after MLS was founded, and this natural market—youth soccer players as well as the parents who support them in the sport—remains largely untapped. That is indicative of the MetroStars/Red Bulls' spectacular failure to create any significant presence in New York City, and it's why MLS was so desperate for "NY2" in the first place. I'm glad to see that NYCFC understands the culture here, the enormity of the task ahead of them as well as the rewards they stand to receive if they can be successful where their predecessor club failed. The more I hear from NYCFC's leadership, the more excited I am for 2015. They seem to be hitting all the right notes so far.